A male body, in contrast to a female body, gives the impression of being composed by straight lines. Notice that the lines of its shoulders are straighter and wider. Their trunk has a triangle shape and muscles are more detailed. 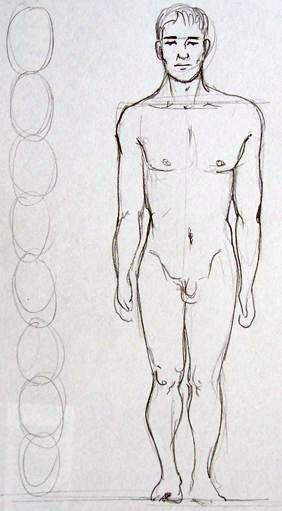 Men are generally taller; this model has been drawn in a scale of 8 heads. 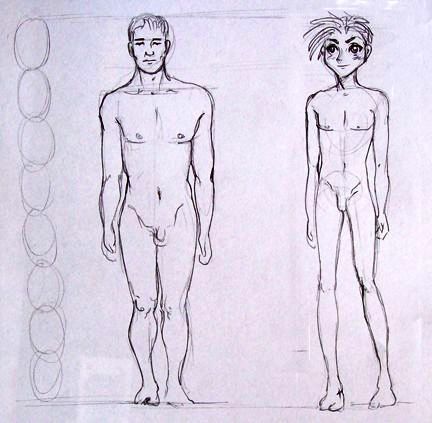 To achieve a Manga version of a male body, we shorten its trunk again. Their shape, even though they have more angles than a female body, are also styled. Their legs are exaggeratedly slender and long. By thinning the body, their head stands out and the character looks younger.